Running a business can be tough. There are meetings to attend, decisions to make, and employees to motivate. As a business owner, you want to take productivity and performance to peak levels, and once there, to keep it there. 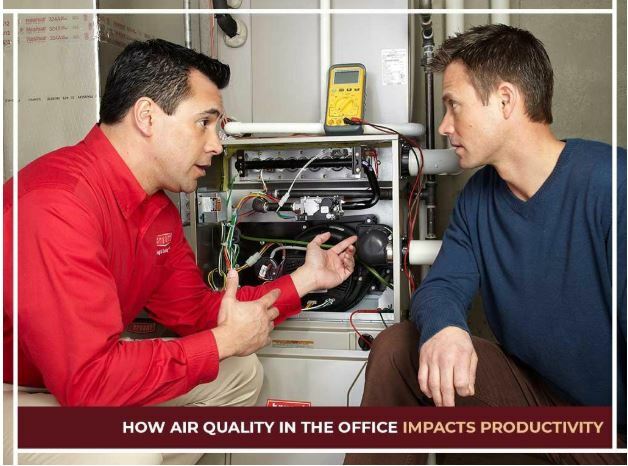 A lot of factors can affect this, but did you know that proper air conditioning and air quality play an important role in productivity? Studies show that maintaining a cool and comfortable atmosphere inside the office correlates to higher performance and productivity levels. But how can you build achieve this cool and comfortable atmosphere? Businesses often make decisions based on what can provide them with the most benefits. As a manager, you may be faced with the decision to invest in a good HVAC system. Installation is often costly, so it may be tempting to forego a new air conditioning unit for other things. Keeping a comfortable level of temperature inside the workplace, however, can increase productivity by up to 30%. Investing in a good HVAC system can have high initial costs, but this expense is easily recouped with an increase in performance. A 30% increase is a noticeable difference. It’s equivalent to finishing the work of one additional employee for every three people you have. The air quality inside the office helps maintain the health of everybody inside it. Imagine all the lost hours wasted on employees getting sick once every few weeks. If you put a price on that and compare it to the price of a good air conditioning system, it’s easy to see that after a short period, you would have received a return on your investment, perhaps with even a little profit to boot. Air quality is easily overlooked because we don’t especially notice comfortable temperature levels when we’re busy, but make a small change of a few degrees off this stable temperature and you’ll see a marked difference in employee satisfaction. Make sure your people are properly cared for by guaranteeing the air quality inside their workplace. If you’d like to get started on finding the right HVAC solution for all your office needs, call OK Heating and Air Conditioning at 925-337-8319 right now. Our friendly experts have over 40 years of experience of providing top-notch service in Livermore, CA and all nearby areas.